The romantic house is located in a quiet urbanization about 1 km from the beach and 1.5 km from shopping facilities. The rooms are spacious: 3 bedrooms and a large living room, 2 bathrooms, one of which is en suite, max. 6 beds, crib for free. There is a modern kitchen with an oven and microwave, dishwasher, large refrigerator with freezer, ceramic range. Living area about 45 m2 with heating fireplace. Air conditioning in living area and all bedrooms. 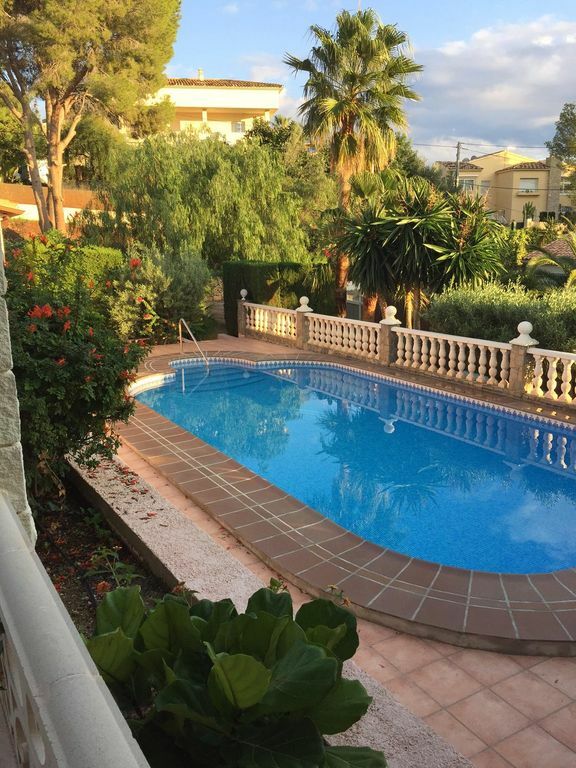 There is also a beautiful garden with some old olive trees, shaded areas under huge fig trees and a large heatable swimming pool(4.5 x 9 m) with sun-cover and comfortable steps. Covered porch and romantic pergola covered by ivy with a stunning ocean view. Paragliding: Paragliding starting point for experienced fliers on the Monte Toix (15 minute drive), fantastic thermal lift during the summer. Climbing and free climbing: Climbers and free climbers will find walls on Monte Toix. Also, there are great climbing options in the SIerra Bernia. Hiking and biking: Especially in the nearby mainland, you will find a lot of interesting possibilities and described routes. Radiant heater in the bathroom. Mediterran Garden with Fruit-Trees etc. A ceiling fan additionally provides for good circulation of air in the living room during the summer and the winter. We have stayed in Altea and in Mas Luz over the winter 2011-2012, nearly 6 months, from early october 2011 to end of March 2012. Coming from Finland where the winter sometimes is very cold and dark we really have enjoined our stay. Altea is without doubt one of the best towns in Spain to spend the holiday or stay for a longer time. The climate is nice through the whole year, even if there can be some rainy and cold days during the winter. Mas Luz has been very suitable for our needs, 3 bedrooms give space enough for temporary guests, the combined living room/dinette with open fireplace is cozy. The garden and the poolarea is very private, nice and relaxing. We have had many memorable moments around the grill area and in many different seating areas in the garden. We like to thank our landlords Jurg and Lilo for their great hospitability and helpfulness not only with the house, but even with some personal issues. Everything in the house has been according to description and we can recommend Mas Luz for either short or long stay, wheather it is in the summer or in the winter. As a best proof of our enjoyment is that we already agreed to spend also the next winter 2012-2013 here in Altea and Mas Luz. Thanks a lot for your very nice review that we do enjoined very much. It's nice to have guests like you two and your dogs. You treated the house like your own and everything was perfect so we are very glad to have you as our guests next october. Have a nice and healthy time until then. Villa med fantastisk pool och trädgård! Charmig villa med jättefin pool och otroligt trevlig trädgård! Från grill-/uteplats finns även utsikt över medelhavet! Lagom avstånd till Altea och Albir med bil. Kan inte bli bättre!! Can‘t read it of course but sounds good. Very nice, clean people. Welcome at every time! Merci de passer vos vacances chez nous. Vous êtes des clients très agréables et vous sommes bienvenue toujours chez nous. Sehr nette Kommunikation mit dem Eigentümer. Alles sauber, zuvorkommend für jedes Familienmitglied kalte Getränke zur Ankunft im Kühlschrank, der Obstkorb war einladend gefüllt. Für jede Wettersituation die passende Terrasse und überall hat man das Gefühl, hier bin ich zu Hause und nicht nur im Urlaub! Grandiose Landschaft und super Ausblick! Leider sind Ihre Ferien schon wieder vorbei. Schön, dass es Ihnen auch in diesem Jahr wieder gefallen hat und Sie in den neuen Betten toll geschlafen haben. Sie sind sehr nette, saubere Gäste und sind uns jederzeit gerne willkommen. Danke nochmals, dass Sie bei uns waren und bleiben Sie gesund! Sehr nette, liebendwerte und saubere Gäste die wir gerne immer wieder bei uns haben. Wenn es am schönsten ist, soll man gehen. Aber wir wollen noch nicht! Aber leider ist die schöne Zeit bei euch vorbei. Vielen Dank an Lilo und Jürg für eure Gastfreundschaft. Wir waren nun schon zum 7. Mal in dieser schönen Villa und es wird nicht das letzte Mal sein. Alles andere haben wir ja schon in den vergangenen Bewertungen beschrieben. Vielen Dank den "Bo's". Es ist immer eine Freude, Euch als Gäste zu haben. Ihr seid Gäste die jedermann gerne beherbergt! Gerne immer wieder. Gute Heimreise und bis zum nächsten Mal! Altea is located 120 km south of Valencia and 60 km north of Alicante. Its historic old city is and was home to many famous artists. The picturesque alleys house many studios and boutiques. The famous church with its blue roof and the church square is a meeting point for artists with market stands and a lot of restaurants. The ocean is very clean due to the pebble beach. Sand beaches can be reached in 10 minutes in the neighboring cities of Calpe and Benidorm. In Benidorm you will also find a large entertainment center with theme parks, Terra Mitica, Terra Natura, the water park Aqualandia and the zoo Mundomar. In the mainland, a lot of interesting small villages will attract you with original and fantastic hiking paths. Costa Blanca is also something special in this area. Altea is surrounded by mountains reaching up to 1600 m. Fertile land reaches into the mainland where lemon and nispero plantations still prevail. On the coast, pebble beaches change over into sand beaches. Golf: In a 5 minute drive to Altea, you will find a very beautifully located golf course 'Don Cayo'. More 18 hole courses are located in Benidorm (3, 15 minute drive away), Denia and surrounding 2 courses (20 minutes away) or in the region of Alicante (4 courses, 35 minute drive away).